The final of this season's Portuguese Cup was filled with expectation, since both Sporting and Académica earned their way into this match on the back of stressful campaigns. Therefore, the chance of an addition to the trophy cabinet was enough reason to see whether either team was willing to throw in one last effort. This article begins with what constitutes one of football's major challenges - the decision making process. Sure enough, we're often told that this sport is all about willpower, attitude and heart, but also tactics and positioning. Decision making is a critical factor between all of those aspects, of which Académica's goal was a perfect example. The play starts with Polga coming out to meet Adrien, who slides to make a tackle, ends up injuring the Sporting centre-back and delivers the ball to a team-mate. Presented with just a couple of seconds, the Lions were not able to make the necessary adjustments (usually, one of the central midfielders fills in as centre-back) and conceded the only goal of the match. Polga, on the floor, is not replaced with anyone, as seen on the yellow circle. leaving Marinho free to score. If Académica were already thinking about sitting back and soaking up pressure, a 4th minute goal would not change their game plan. In fact, Sporting proved once again that they are much better equipped to be the underdogs than to inflict damages on smaller teams. The Students' strategy was plain for everyone to see: arranged in their more traditional 4x3x3, Académica would wait for Elias or Schaars and lure them forward, looking to exploit the spaces that opened up afterwards. 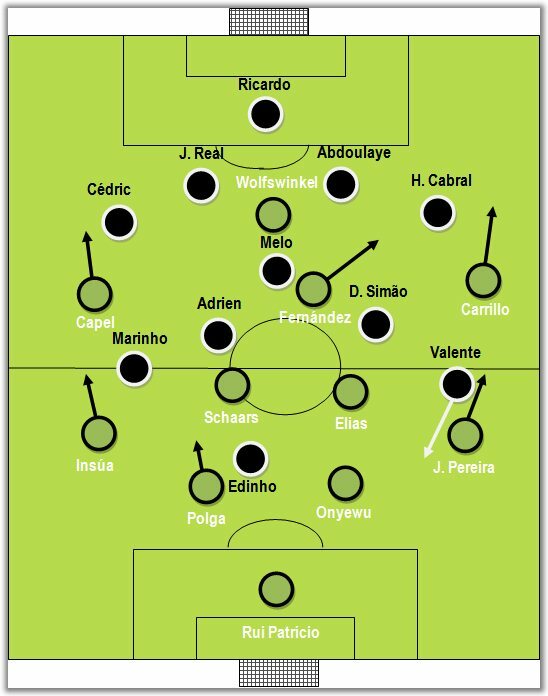 By blocking almost every passing option through the middle, Sporting were forced wide, forced to resort to crosses towards Wolfswinkel, hardly his specialty. Académica welcomed Elias' forward surges, looking to get Sporting off guard. Notice the blue space behind the Sporting midfielder. A few seconds later, Elias falls into the trap and Académica get the space they were looking for. 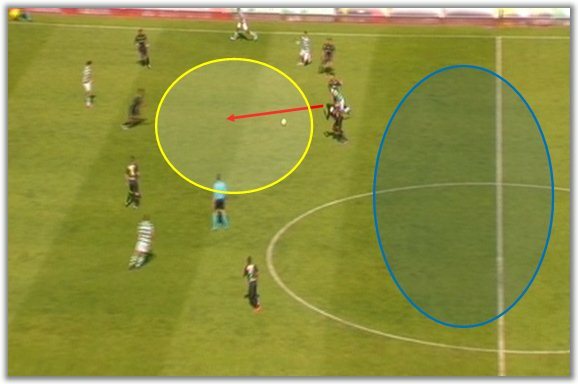 Unlike the newfound 4x2x3x1, the 4x3x3 means that your opponent's wingers are covered by the midfielders (in this case, Adrien and Diogo Simão), rather than the wingers, freeing the latter for quick breakaways. With Diogo Melo man-marking Matías Fernández out of the park, it should be Elias or Schaars' task to make the difference through the middle by taking advantage of the hole left by Melo. 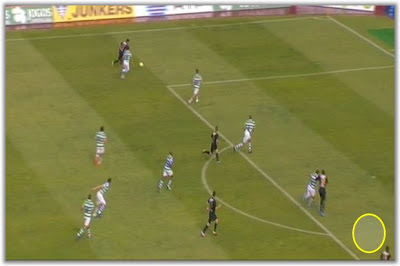 Instead, the Sporting players remained stuck to their original positions and too static. Despite his limited range of movements, Capel was actually the one player trying to stir things up a bit, drawing fouls from his opponents, particularly in the final third. Even though the Lions have been great at taking advantage of set pieces since Ricardo Sá Pinto arrived to the club, this time not even the giant Onyewu was able to make the difference. The second half was rather different - at least at first. 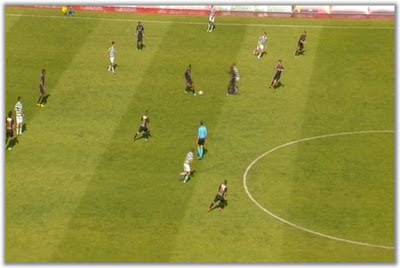 Indeed, the first minute was the perfect example for what would follow for 20 minutes. 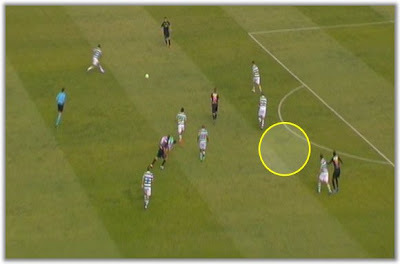 With Izmailov replacing Elias (clearly the case of a player that suffers for being versatile, always seeming to play out of position), Sporting became a team broken in two lines of five players. While they could have scored a few seconds into the second half, they could have also conceded a goal in the play that followed, were it not for Edinho's terrible miss. After 60 minutes, Académica started tiring out and unwilling to keep possession. Even presented with such an opportunity, Sporting were not able to break down their adversary's defence; in fact, Sá Pinto's men showed little creativity - apart from a few flashes of flare from Carrillo - and a worrying inability to bypass opponents willing to do what Sporting did themselves against stronger teams this season. On a side note, Adrien proved once again that he belongs in Sporting's first team and Diogo Simão also showed that he could be a very useful midfielder. If both Sporting and Benfica are interested in developing both these players, they could prove interesting additions to the national team's future plans.